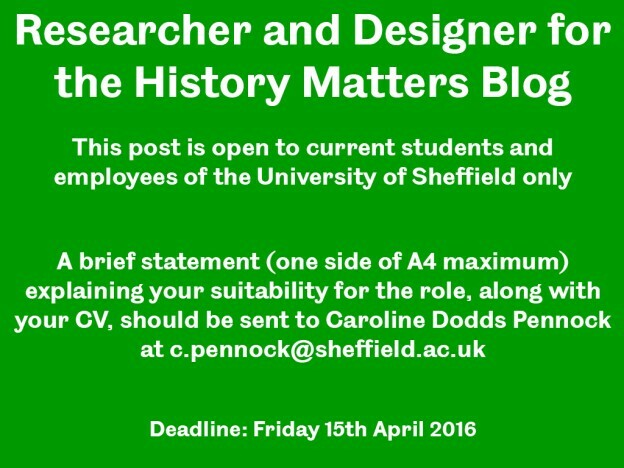 The Department of History wishes to recruit a promising candidate to help develop its well-established History Matters blog into a major public-history resource. Having been active since 2012, History Matters needs not only cosmetic and technical refreshing, but has also accumulated a significant archive of articles which need cataloguing and reorganising into a new more user-friendly interface. – and to categorise the content in a way which targets current A-level topics and appeals directly to History students. and redesigning the blog’s structure and interface. The successful candidate will receive any necessary training in the use of WordPress and associated technologies for blogging, including plug-ins and the operation of Content Management Systems. As well as working with the blog editors, the designer will also receive support from the History Department’s IT & Learning Technology Manager, James Pearson, who is the blog’s technical advisor. This post is for five hours per week (though there may be some flexibility from week to week), with an immediate start date and an end date of 30 September 2016. This role is paid at grade 6.1 on the University of Sheffield salary scales (£13.71 per hour, plus holiday pay). A brief statement (one side of A4 maximum) explaining your suitability for the role, along with your CV, should be sent to Caroline Dodds Pennock at c.pennock@sheffield.ac.uk by Friday 15th April 2016. Informal enquiries about this post should be directed towards Caroline Dodds Pennock: c.pennock@sheffield.ac.uk, 0114 222 2579. This entry was posted in News and tagged History Matters, Jobs, Research on March 22, 2016 by Alice Johnstone.